Do you suspect pesticide contamination from a soil amendment? Aminopyralid toxicity toward tomato plant. A subclass of growth regulator herbicides known as pyridine carboxylic acid herbicides are suspected in many garden soil contamination reports across Montana from 2009 to 2010. This is due to the high persistence many portray under anaerobic conditions commonly present in compost, manure and soils as well as the advent of a new pyridine chemistry previously not active in Montana's rangeland landscape. This new pyridine carboxylic acid chemistry known as aminopyralid is used to control broadleaf weeds without impacting desired grasses. The digestive system of livestock doesn't break down aminopyralid (or other growth regulator herbicides), thus manure collected serves as a source for pesticide contamination if used around homes or in gardens. Effects of aminopyralid residues have been observed in other states as well. Dairy organic matter (manure, composted manure, silage) applied to broadleaf crops on farms and gardens in Washington caused non-target toxicity in 2009 and 2010 (Herbicide contamination in Whatcom County). 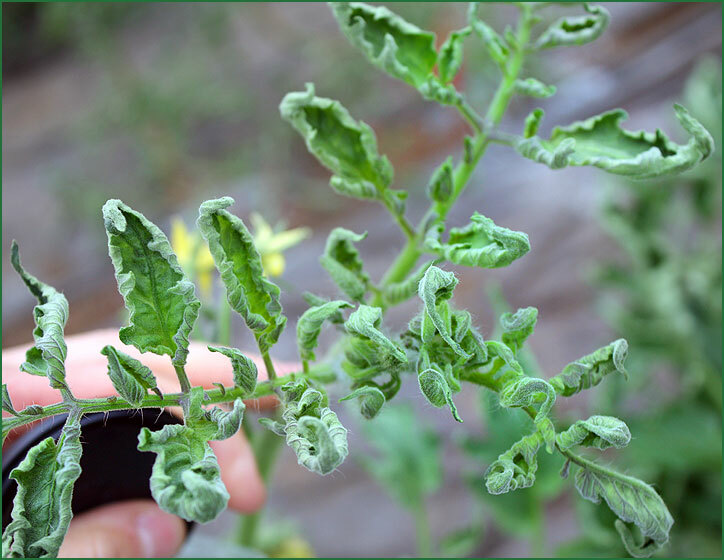 Aminopyralid and other auxinic herbicides cause the most severe damage to highly sensitive broadleaf plants such as tomato, beans and peas. Plants usually won't die, but will produce sub-lethal symptoms at levels as low as 5 parts per billion (Washington State University, 2010). The lowest benchmarks for sublethal damage towards highly susceptible plants hasn't been established. Sublethal effects often include stunting, leaf cupping and low quality fruit. Aminopyralid contamination is often due to applicator neglect in reading and following the entire product label. See the DOW Agro Aminopyralid Stewardship factsheet for more information. It should be noted that other herbicides may cause non-target pesticide toxicity similar to aminopyralid in gardens. Other growth regulator herbicides include benzoic acids (dicamba), phenoxy herbicides (2,4-D), and other pyridine chemistries (picloram, clopyralid, triclopyr, fluroxypyr and aminocycloyrachlor). If you suspect pesticide contamination from a soil amendment conduct a soil bioassay. Go to WSU's website for details on conducting a soil bioassay (WSU SOIL BIOASSAY PROTOCOL). The results of a soil bioassay will determine which avenue you wish to follow. What if a soil bioassay indicates you don't have pesticide contaminated soil? If a soil bioassay doesn't indicate soil contamination then you may wish to address other potential biotic (insect, plant disease) or abiotic (nutrient deficiency, water stress, pH) factors by contacting your local MSU county Extension Agent who may conduct an investigation of his/her own with the support of MSU Schutter Diagnostics. What should you do if your garden is contaminated with a growth regulator herbicide? It is difficult to determine how long it will take a pesticide to break down to safe levels in a garden. This will vary according to tillage, soil characteristics, watering, and pesticide found. Pyridine carboxylic acid pesticides such as aminopyralid, clopyralid or picloram may take from 3 - 5 years to break down to safe levels while 2,4-D and benzoic acid formulations usually break down to safe levels much sooner. This can be quite expensive for some homeowners and many commercial establishments. For that reason individuals must make an informed decision as to whether they wish to seek enforcement action or not. Enforcement Action: If you need legal advice or wish to seek reimbursement for damages to your commercial / private establishment contact the Montana Department of Agriculture (406)444-5400. Non-Enforcement Action: Contact your local MSU county Extension Agent for recommendations or further analysis of your contaminated soil for auxinic (growth regulator) herbicides. If aminopyralid is suspected, the DOW Agro Stewardship Program may cover the costs of testing your soil for aminopyralid contamination. Results of using the DOW Agro Stewardship Program cannot be used for enforcement purposes. Individuals may also contact the MSU Pesticide Education Program at (406)994-5067 for more information regarding pesticide contamination. Homeowners should conduct bioassays prior to ever planting broadleaf plants into gardens previously contaminated with pesticides. The best option often is to move garden sites to areas not contaminated with pesticides. For more information on contamination from aminopyralid products see the DOW AGRO website at manurematters.com, or the aminopyralid stewardship brochure. Go back to non-target plant toxicity page.